These 5-Ingredient Apple Cinnamon Overnight Oats are great for quick and busy mornings! They take 5 minutes of prep the night before and are so delicious! Vegan and GF! I want to start by saying thank you so much for all your kind words and your donations!! You guys really helped to make a difference and I’m so happy to know that I’m surrounded by so much support, love and happiness. Let’s get right into it then, shall we? 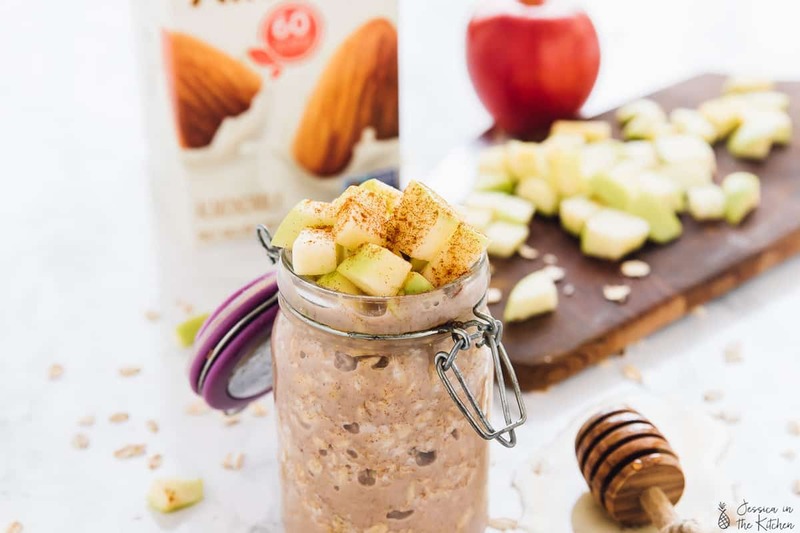 Here I present to you – these Apple Cinnamon Overnight Oats. They’re easy to make, very ready for fall and oh – 5 ingredients friends. If you’ve never tried overnight oats, I promise – you need to try these. If you’re already a fan – add this to your hit list! 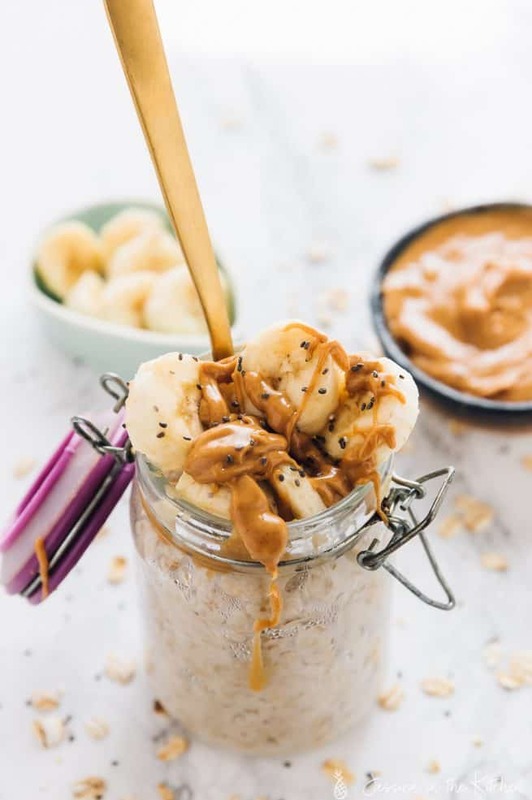 So last week I shared my peanut butter banana overnight oats with you. A lot of you asked for even more overnight oats recipes. Not later, NOW. Ask and you shall receive friend!! I know it’s still back to school season. Whether you’re the mom or you’re the student, prepping breakfasts can be so time consuming. Trust me – years of 8 am classes in law school will teach you to find a delicious and quick breakfast meal!! Overnight oats have been SO helpful in the meal prep process because of just how easy they are to make. 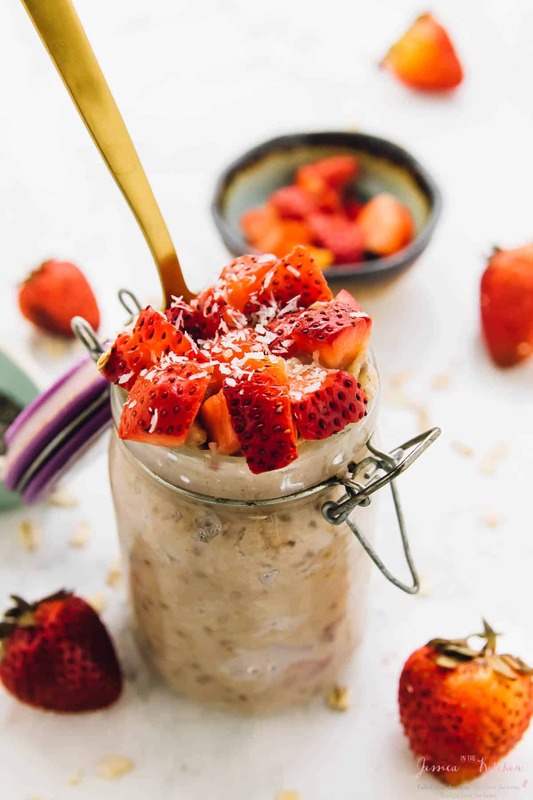 If you’re still kind of clueless as to what Overnight Oats are, they’re a really easy 5 minute breakfast dish made in your fridge. Yes, you read that correctly. You add the ingredients to a jar, store them in your fridge, and then the oats soak up the liquid and make oatmeal overnight. They are perfect for grab and go breakfasts. Also, they help to eliminate any excuse to not have breakfast! You can customise them to your heart’s content too! If you haven’t tried my Pumpkin Pie Overnight Oats, you need to put that next on your list. 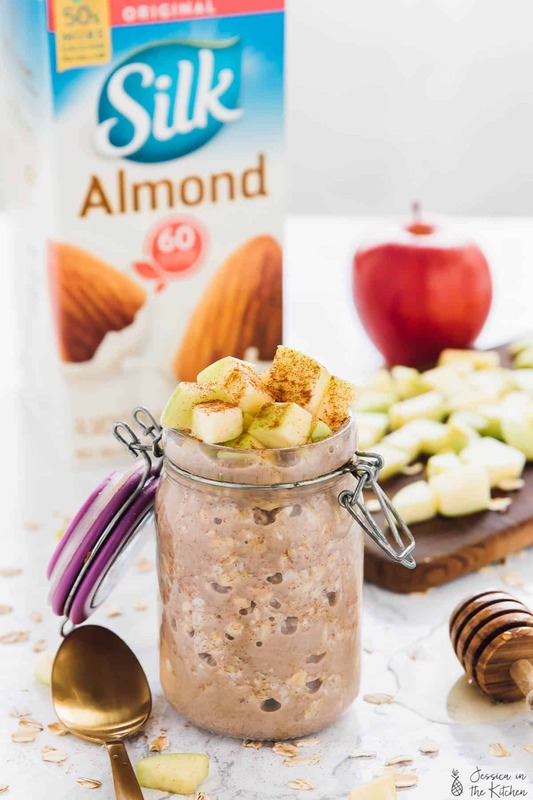 These Apple Cinnamon Overnight Oats are inspired by reality and apple pie. Since it’s almost fall, you’ll probably have apples around all the time, so these overnight oats will come more naturally. Did I mention there are only 5 ingredients?! Again, inspired by reality – quick, easy ingredients you probably already have in your house. Chopped apples – loaded with fibre, starts your day with a fruit! cinnamon – helps to stabilise and lower blood sugar levels which is great for breakfast! maple syrup – lower glycemic level sugar plus it tastes delicious and helps to naturally sweeten your breakfast! 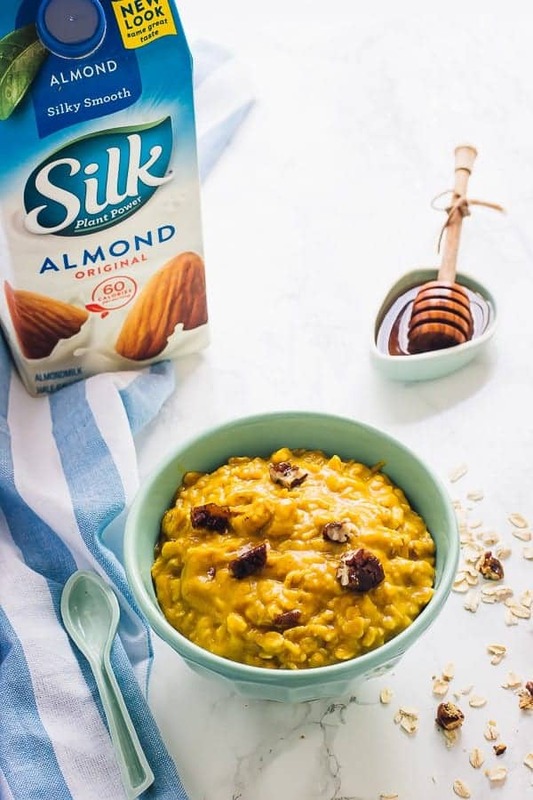 Silk Almondmilk – twice the calcium as dairy milk, keeps this recipe vegan and so smooth! old fashioned oats – loaded with fibre, protein and helps to keep you full!! That’s it. It allows you to whip these up really quickly in the night, heat them up in the morning and grab them for breakfast. I really love the apple cinnamon combination in general here. The two pair so well together and it’s really the only spice you need for this. Alternatively, you could definitely use a spice mix and it’ll taste even more like apple pie. 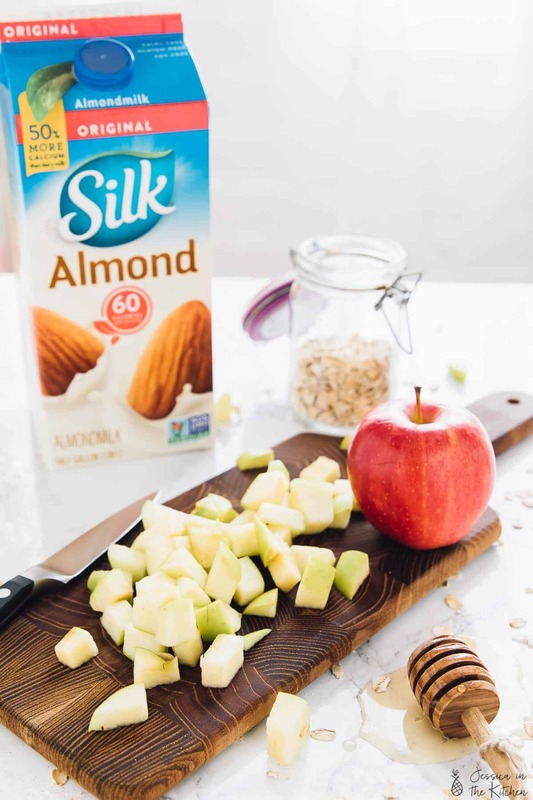 I of course also love how smooth the Silk Almondmilk is in this recipe. 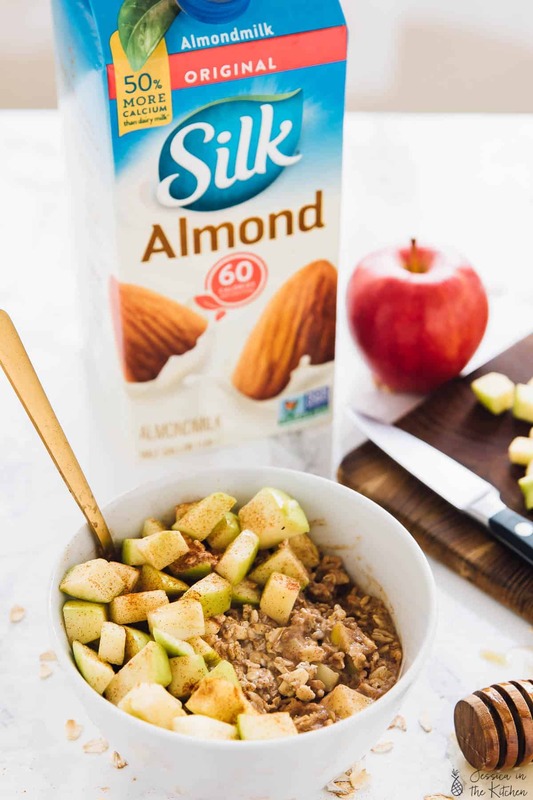 It’s my go to choice for nut milks and plant-based mills in general, and so delicious in this easy apple cinnamon overnight oats dish. I’m counting down to fall, although you can definitely enjoy this dish now! Crisp apples, warm cinnamon, comforting oats, apple pie flavour…what’s not to love? Enjoy friends! This is a sponsored conversation written by me on behalf of Silk. The opinions and text are all mine! Thanks for supporting brands that support Jessica in the Kitchen! 1. Mix all the ingredients in a jar. Stir to combine and cover. 2. Place in the fridge overnight. 3. The next morning, remove and eat in the jar or place in a pot over medium high heat to reheat the oatmeal, or in the microwave to reheat if a microwave safe jar for about 45 seconds. Top with fresh apples and more Cinnamon if desired. 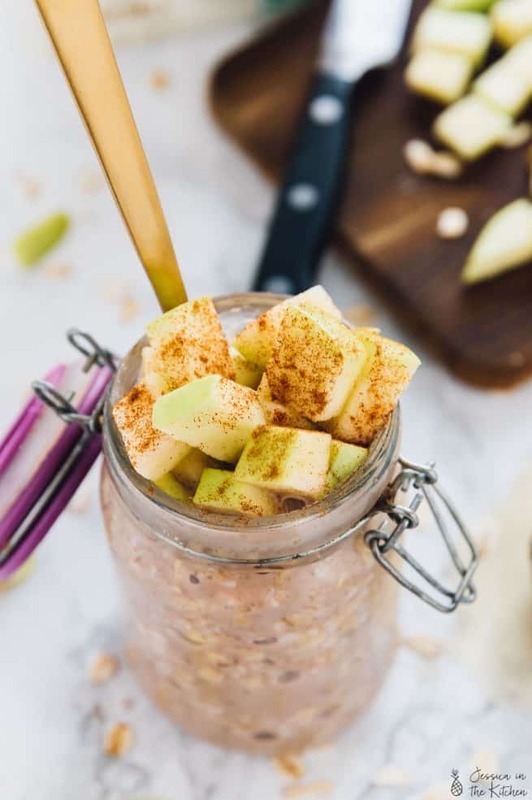 If you try this Apple Cinnamon Overnight Oats recipe please let me know in the comment section below, or tag me on instagram with the hashtag #jessicainthekitchen! For more exclusive recipes follow me on Instagram AND on Snapchat: jessinkitchen. It looks like a perfect treat to start the day! I have been seeing these overnight oats for a long time. I just made your recipe to give me more energy because I have to cook early in the morning for a client. Thank you. So happy to hear it helped you and you enjoyed it!! You’re so welcome!! Oh thank you so much!! I hope you enjoy that one too!! Thank you for sharing!! I will try this recipe very soon.